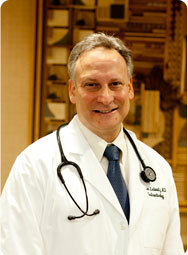 Dr. Steven Leibowitz has practiced with his father, Dr. Arnold Leibowitz, since 1989. Affilatied with Hackensack University Medical Center, the group utilizes the most advanced diagnostic and therapeutic modalities in managing inflammatory bowel disease, colorectal and GI malignancies, peptic and motility disorders and hepatobiliary diseases. A graduate of Georgetown University Medical School and trained at Cornell University-North Shore University Hospital and Memorial Sloan-Kettering Cancer Center in New York, Dr. Leibowitz prides himself on blending his expertise with quality time in providing care for his patients. Dr. Steven Leibowitz was awarded Top Doctor in 2009 published in New Jersey Monthly magazine and serves alongside his father as Consultants in Gastroenterology to the New York Football Giants.